Tacoma, Wash. – February 21, 2017 – General Plastics Manufacturing Company, leading provider of high performance rigid and flexible polyurethane foam and build-to-print parts, will participate in this year’s JEC World International Composites Event in Paris, France on March 14 – 16, booth R39a in Hall 6. The company will showcase various product lines which address the industry challenge of producing lighter, stronger and cost-effective composite parts, with an emphasis on safety. Conference attendees can expect to see application samples of General Plastics’ signature LAST-A-FOAM® rigid foam series. Due to unique chemical formulas, products are exceptionally uniform and consistent in all physical properties, strong, durable and versatile. Customers have a wide range of products to select from based on application specifications, including tooling and core requirements. Included is FST/OSU-compliant FR-3800 FST rigid foam which can be thermoformed under specific conditions, is easy to machine and bonds securely with composite skins. This foam series, as well as two LAST-A-FOAM® rigid foam product lines – FR-4700 for applications with peak temperature up to 400°F and FR-6700 which complies with aerospace specifications – are also supplied as complex molded or cast parts. This rigid, self-skinning foam can be shaped based on customers’ requirements, and texture and color specified. Some aircraft interior applications include various panel configurations, decorative flyaway parts, and as replacement for aluminum parts. Non-aerospace customers may also benefit where applications require raw material cost reduction, light-weighting and cost savings for high throughput parts. 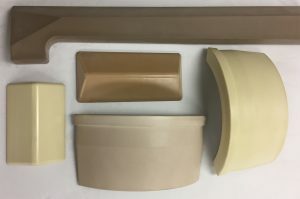 In addition to rigid foam sheets, blocks and molded parts, General Plastics produces custom molded parts that are manufactured from flame-retardant, self-extinguishing and self-skinning flexible polyurethane foam materials. Examples of typical molded parts include various flight deck components, bin-to-bin closeout seals, header seals, and armrest pads. Services offered include part and tool design, mold tooling manufacture, and production of parts through all phases to completion. General Plastics proven build-to-print capabilities and high-capacity production facilities enable it to scale production from small runs of specialty parts to ongoing, high-volume OEM and Tier 1 and Tier 2 parts programs.